BANGKOK (Reuters) - An international observer group said it would face limitations in judging to what extent Thailand's general election on Sunday is free and fair, partly because it was granted accreditation too late to get more than 35 monitors into the country. Voters go to the polls on Sunday in the first election since a 2014 military coup in a race broadly cast as between the current junta leader, who is seeking to stay on through the ballot, and anti-junta parties led by loyalists to exiled former premier Thaksin Shinawatra. 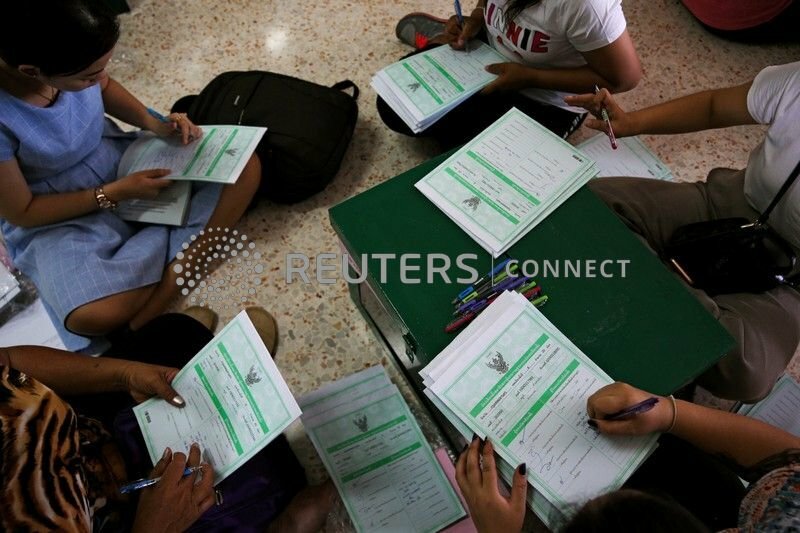 The Bangkok-based Asian Network for Free Elections (ANFREL), which sought accreditation in November, had hoped to deploy 80 observers for an electorate of 51.4 million people. But permission to monitor the poll was only granted on March 14 and so less than half that number will be on the ground for an election critics say has been stacked in favour of the military by the country's junta. "Unfortunately ... we were not able to bring all the observers we had planned to because of visa issues," ANFREL Secretary-General Rohana Nishanta Hettiarachchie, and head of the Thai vote mission, told Reuters. Asked to respond, a government spokesman and a spokeswoman at the foreign ministry referred Reuters to the election commission, which was not available for comment. Thailand's vote comes after nearly five years of direct military rule and is viewed as a contest between junta leader Prayuth Chan-ocha - who wants to stay on as elected leader - and a "democratic front" of parties led by the ousted pro-Thaksin Pheu Thai. A third faction, led the anti-Thaksin establishment Democrat Party, argues it can form a government that is neutral. A parliamentary system created by a new military-backed constitution, however, gives pro-junta parties a huge advantage over their rivals, including Pheu Thai, which is expected to win the most votes. Rights groups had called on the military government to allow foreign observers to monitor the election, but only ANFREL was given permission last week. "As international observers, we have our own limitations. We can't challenge the law of the country," said Hettiarachchie, a Sri Lankan national. "The legal framework itself is not supporting the free and fair elections." The European Union said in a statement on Friday that it had not received an invitation to observe the election in time and would deploy staff members on a "diplomatic watch" for internal reporting only. The United States, which downgraded ties with Thailand following the 2014 coup, said it was "very keen" to see Thailand return to an elected government. "We hope ... Thailand sees a government that reflects the will of the people," Principal Deputy Assistant Secretary for East Asian and Pacific Affairs, W. Patrick Murphy, said on a conference call with reporters in the region on Friday. Major parties held their largest rallies yet on Friday evening, ahead of the campaign cut-off time at 6:00 p.m. (1100 GMT) on Saturday. More than 93,200 polling stations in 77 provinces will open at 8:00 a.m. (0100 GMT) on Sunday. Junta leader Prayuth Chan-ocha crooned a ballad at a Friday rally of the military proxy Palang Pracharat Party's in Bangkok to make his final pitch for staying on as prime minister. Almost simultaneously, Thaksin, whose affiliated parties have won every election since 2001, said at his daughter's wedding reception in Hong Kong: "We will win for sure." Seated beside the former telecommunications tycoon was the elder sister of King Maha Vajiralongkorn, Princess Ubolratana Rajakanya Sirivadhana Barnavadi, who shocked the country last month by accepting a Thaksin-linked party's nomination for prime minister. She was quickly disqualified by the election commission and the party was later banned from the race for breaking a taboo of involving the monarchy in politics. The new constitution written by junta supporters allows parliament's upper house, the 250-seat Senate, to vote with the 500-seat lower house to choose the prime minister - and the Senate is entirely appointed by the junta. Under those rules, pro-military parties would probably need only 126 seats in the lower House of Representatives to win a majority in a combined vote, while opposition parties would need 376 seats. Pheu Thai's long-time rival, the Democrat Party, told voters at its Friday rally that they did not have to choose between "dictatorship" and "corruption", respectively referring to Prayuth and Thaksin, who fled the country to avoid corruption charges in 2008. "Time's up for dictatorship. Time's up for corruption," said its leader, Abhisit Vejjajiva, who could hold the key to power after what is expected to be an inconclusive poll that triggers intense horse-trading among parties to form a government. "It's time for 'democracy with integrity.' Vote Democrat." An iron fist vs thieves......great choice Thailand! Many expats will be echoing these words next year. "Unfortunately ... we were not able to bring all the observers we had planned to because of visa issues,"
yes, welcome to the club. now go sit in cage. Iron fisted thieves vs. velvet gloved thieves. The EC has invited international observers only two weeks before elections. No more comment needed. They don't want obvious election rigging to be spotted by trained observers. My wife just went to vote and told me that she counted the parties on the ballot at 35 but here's the thing, they left Thai Raksa Chart on there !!! So a disbanded party is still on the ballot paper, which means people can still tick it as their choice but their vote will be void..
Edit I have moved this from general forum as no politics is allowed there, I didn't know that..